European economies currently outperform in generating income from tourism, but growth in tourist spending is twice as fast in emerging markets as they close the gap, shows research by UHY, the international and consultancy network. European economies, on average, have a higher level of tourist spending in their countries as a percentage of Gross Domestic Product (GDP) (2.1%) compared to emerging markets (0.7%). However, the UHY study reveals that emerging markets are outstripping European economies in the rate of growth in tourist spending in the countries. On average, emerging markets saw tourist spending increase twice as fast as European economies over the past two years (2.2% compared to just 1.1% growth for Europe). UHY explains that a main driver behind the slower rate of growth in tourist spending is that many European economies are often unable to upgrade tourist infrastructure capacity as quickly as many emerging markets. Europe and other established tourist destinations currently benefit from recognised attractions, landmarks and well-developed transport networks, but the gap is closing. Emerging markets are increasingly investing in the infrastructure needed for large numbers of tourists. The UK is struggling to increase airport capacity, with Heathrow already operating at 98% and plans for a third runway have just been finalised by Government Ministers in early June 2018 after more than decade of debate. The UK saw the biggest percentage drop (9%) in tourist spending, although it has been boosted since then by impact of the collapse in the value in the pound. Germany is also facing difficulties in developing tourist infrastructure with the planned new Berlin Brandenburg Airport facing years of delays having been scheduled to open in 2011. In contrast, China is heavily investing in the infrastructure needed for large numbers of international visitors. For instance, Beijing Daxing Airport is set to be the largest airport in the world when it opens in 2019 and Guangzhou’s new airport has expanded to accommodate 100 million passengers annually. 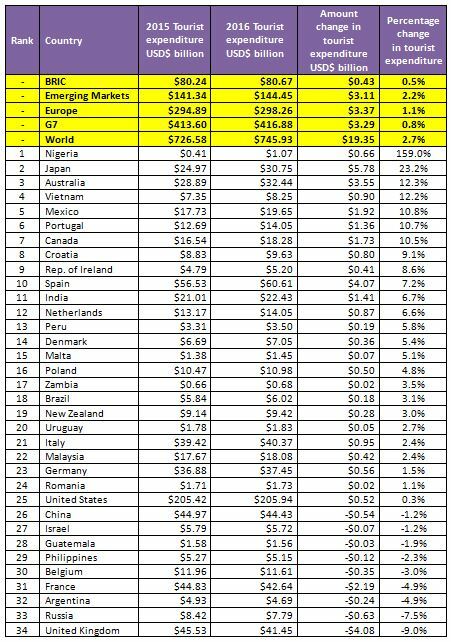 UHY studied 34 countries around the world, looking at spending by tourists (including travel to the country) in the past two years as a percentage of that country’s GDP. 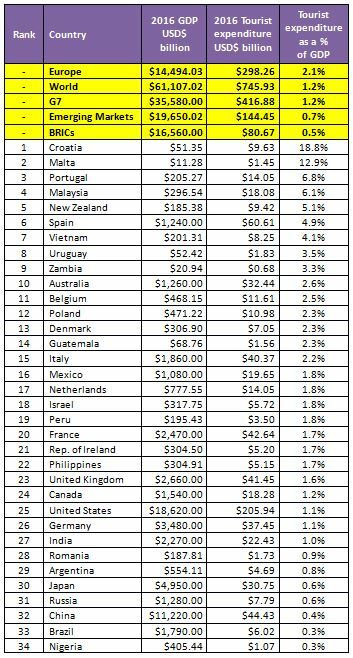 Croatia came top of the UHY table for tourist spending as a percentage of GDP, with tourism worth 18.8% of its GDP – some USD $9.6 billion. Asia-Pacific also featured highly with Malaysia (6.8%), New Zealand (5.1%), Vietnam (4.1%) and Australia (2.6%) all in the Top 10. UHY adds that additional recent research underscores the scale and importance of tourists from emerging markets visiting other developing economies. The amount Chinese tourists spent on foreign travel, for instance, totalled $261 billion in 2016, up from just $73 billion five years earlier in 2011. Helena Budiša from UHY UHY HB EKONOM d.o.o. in Croatia, says: "Tourism is the most important sector in our country and every year has a significant increase of more than 10%. Additional increases are expected this year, especially due to large investments in Zagreb, Split and Dubrovnik airports which doubled their capacities and new terminals can receive a total of 11.5 million passengers a year." "The government initiatives have proved vital in nurturing such a critical industry, including charging lower VAT on hotels and accommodations, as well as giving tax breaks on food and accommodation for seasonal staff who are necessary for maintaining top tourism services." However, UHY adds that many larger economies are putting in plans to place greater importance on the tourist sector. In Japan the Government aims increase the number of tourists visiting the country with the goal of seeing 8 trillion yen (approximately $70USD billion) in revenue from tourism by 2020. Source: IMF and UNWTO (UN World Tourism Organisation). Numbers have been rounded. *In 2016, latest data available. Established in 1986 and based in London, UK, UHY is a leading network of independent audit, accounting, tax and consulting firms with offices in over 320 major business centres across more than 95 countries. Our staff members, over 8,100 strong, are proud to be part of the 16th largest international accounting and consultancy network. Each member of UHY is a legally separate and independent firm. For further information on UHY please go to www.uhy.com. We welcome, Hadi Hesab Tehran, our new member firm in Iran, to the global accountancy network UHY, extending our coverage within the Middle Eastern region.